Virgen de Gracia´ School has a semi-open educational model which is100% focused on the development of students in all stages, from Early Childhood Education up to High School. From our center we work through unique pedagogical projects with registered trademarks and intellectual property based on thorough, relevantresearch from the fields ofneuroscience, psychology and education. Our pedagogical model is based on a semi-open system that incorporates various methodologies which are at the forefront of education. In early childhood we apply neuroscience, early stimulation and the Montessori methodology. In Primary School, we continue with different learning styles and routines of thought.In High School we complete the model with projects which test our students’ comprehension and assist in their development and preparedness for the future. The aim of this school is to seek new forms of integration between family, school and social environment which we implement in our classrooms along with our own model & patented known semi-open system. This system has enabled us to apply different educational methodologies that allow us to offer the child an opportunity to be in direct contact with their environment & surroundings, to experiment freely and to “learn by doing”. It is a constructive learning approach that allows us to help each and every one of our students develop the potential that people have from Early Childhood education to High School. This system has enabled us to apply different educational methodologies that allow us to offer the child an opportunity to be in direct contact with their environment & surroundings, to experiment freely and to “learn by doing”. What are the advantages of our educational model based on a semi-open system? Offers our students be in direct contact with their environment & surroundings. Transforms the curriculum and adapts it to the specific needs of each of our students to enable impactful and personalized learning. Changes the expectations of parents with regard to their children’s learning. 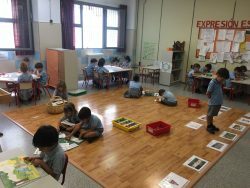 Opens the spaces and zones in the classrooms to our different methodologies and learning styles. Changes the educational expectations of teachers and their students as they enhance the different skills in order to increase their skills. Opens the Center to families, enabling them to further facilitate their children’s learning. Ongoing coordination between ALLteam members who share in a project. An open mind to adapt to all methodological changes. Counselor and facilitatorguidance of yet minimal interference in student learning, empowering students to become their own protagonists of their education. To contribute to the improvement of the educational potential of the family. Improve your educational understanding by contact with the professionals. Carry out joint, intentional and educational actions and lessons. We understand education is a task shared by parents and teachers, so we try to involve everyone in the daily education of our boys and girls. Through this understanding we are able to agree on educational and personal objectives & criteria for our students which help them enjoy their childhood while building a safe and balanced personality since its inception. In the Semi-open system students show more critical attitudes toward people and their environment, express their opinions free of prejudice and develop their creativity through various activities. This is achieved with the individual attention that our students receive, allowing them tobecome independent within our Center. With family participation and collaboration, the social development of the child is guaranteed to occur without trauma. Our variety and adequacy of spaces and materials offer ample opportunity for significant learning through experience. This allows us to achieve results which best reflect the state of satisfaction and happiness that our students bring to and from Center.